Dollops of Diane: National Reading Month: Give the Gift of Literacy! National Reading Month: Give the Gift of Literacy! Did you know that experts believe that almost 40% of 4th graders don’t have basic reading proficiency? Did you know that 2/3 of American children living in poverty do not have ANY books at home? These statistics are alarming to me. My 3 and 4 year old (who can’t even read yet) go to bed with about twenty books each in their beds to look through at night. I often go in to my 19 month old’s room in the morning to find him happily sitting and thumbing through a board book. Imagine living in a house with no books? I can’t (and I’m not even personally an avid reader!). Instead of just pushing these facts aside, Stowed Stuff and I have decided to try to do something about it. In honor of March being National Reading Month, we have decided to support Reading is Fundamental (RIF) in their vision of “a literate America in which all children have access to books and discover the joys and value of reading.” RIF delivers free books and literacy tools to the people who need them most. Volunteers spend their time in schools, homeless shelters, and wherever they are needed most to plant the seeds of learning in the next generation. How could we not want to help? How could YOU not want to help? We are asking that each of you make a small donation and help us with this journey. All you need to do is click on DONATE in the box below and follow the instructions. We are also not going to be doing this for just today but also for the entire month of March. Yup, that’s right, get ready for lots of reminders about it! Through the end of March, you will see the donate box on my right side bar so you can donate at any time. I would also love, love, love if you would share this post with others. Shares = More Views = More Donations = Happy Dollops. If your children are anything like mine, they have access to endless books around the house (I trip over them constantly! ), they have easy access to local libraries where any book they need can be at their fingertips, and they have access to the internet which can help them learn to read. Please take a moment to think of the children who do not have these luxuries. Please think about them and then click donate. Every little bit helps. We can make a difference – one book at a time! 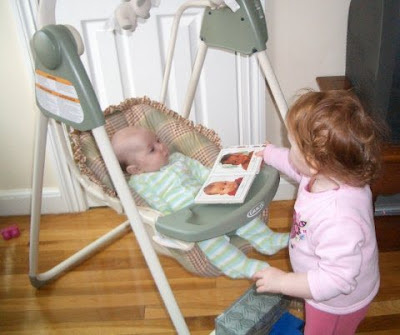 Toddler Isabelle reminds us it's never too early to start reading to our family!